Situated on 5 acres of land peppered with oak, pine, madrone, and manzanita trees, the Templeton Tennis Ranch is the perfect venue to play a match with a friend and enjoy the surrounding scenery. Turns out, it's a place professional players want to enjoy, too. THE GAME The Templeton Tennis Ranch is the first local club to host a professional tennis tournament on the Central Coast. 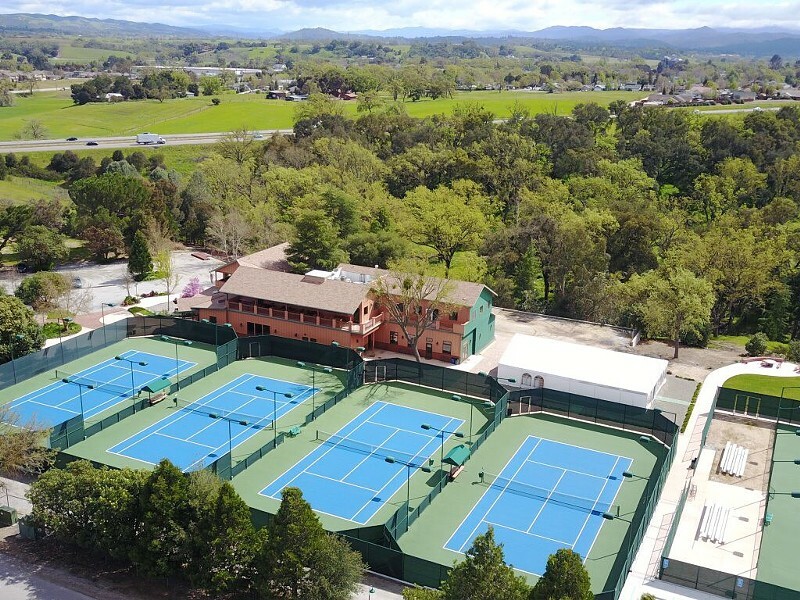 The United States Tennis Association (USTA) selected the Templeton Tennis Ranch to host the first Central Coast Pro Tennis Open, which will take place Sept. 24 through Oct. 1. Owner Ralph Goehring said he was surprised to find out that his club was chosen for the tournament, but it's something that he has been working toward. "A USTA scout was looking at the club without my knowledge and reached out to us about hosting an event," Goehring said, adding that hosting a tournament is something he wanted to do even before the facility launched in 2015. The club was opened with the intention of bringing the game to North County but not limiting access to the courts. Currently, there aren't as many players as Goehring anticipated there would be. But he said the nearby town of Paso Robles is growing, which he believes will add to the tennis community. To his knowledge, Goehring said, the ranch is the only facility in the county that has a stadium tennis court. The facility has six tennis courts (one which is stadium size), four pickleball courts, and a fitness center. Even with all the equipment and facilities in place, it's still a lot of work to put together an event where locals and visitors come together to root for professional players. "Not every club wants to host because it's a lot of work and there isn't a guarantee of money," he said. Although there are some uncertainties, Goehring said he is all in. He laughed as he listed the ways that the ranch has been getting the word out about the event: print articles, the radio, television ads, social media, and brochures. Tennis enthusiasts can enjoy the eight-day event and families can bring their little ones to the kids' activity-centered days. The ranch is also currently looking for 72 local ball kids and adults to retrieve balls for players during the matches. "It's exciting and it's an advantage to have a tournament like this because you're close enough to the players and meet them off the court," Goehring said. Having this up close and personal experience is one that Goehring is excited to share with his community and the entire Central Coast. Currently, Twin Cities Community Hospital, Tennis Warehouse, and J. Dusi Wines have signed on with the ranch as key sponsors of the event. To find out how to be a sponsor or for ticket information visit ttrtennis.com. "This is not just about Templeton Tennis Ranch," Goehring said. "It's about putting our entire region on the tennis map. Our hope is that this inspires our local tennis enthusiasts to come together." • On Sept. 15, 97.3 The Rock increased its listenership by adding a new signal at 107.9 FM in Paso Robles, covering San Miguel, Atascadero, and Templeton. Since 2014, The Rock has provided Estero Bay with hyper-local community radio with a crew of 53 volunteers hosting shows of all genres, from music to talk. The Rock also streams live at centralcaliforniaradio.org. Staff writer Karen Garcia wrote this week's Strokes and Plugs. Send tips to kgarcia@newtimesslo.com.